The Doctor brings the TARDIS to London, the year 1666. However, the Doctor and his friends are not the only visitors. Death stalks the local woods, complete with cloak, scythe and a skull-like face. In fact, 'Death' is an android brought by a group of alien Terileptils whose spaceship has crashed. With Adric and Tegan captured, the Doctor and Nyssa team up with out-of-work actor Richard Mace to try to deal with the deadly android. Can they prevent the Terileptils from unleashing an even more deadly form of the Black Death? 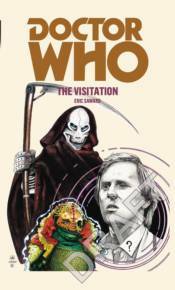 This novel is based on a Doctor Who story which was originally broadcast from 15-23 February 1982. This title features the fifth Doctor as played by Peter Davison with his companions Adric, Nyssa, and Tegan.